On Saturday, after his third goal, the Highmark Stadium PA announcer informed the crowd that Rob Vincent had broken the Riverhounds record for goals in a season. While technically, that record may be true for existing USL league format (since 2011), the franchise’s single-season record actually belongs to Brazilian Tiago Martins, who scored 23 goals in 25 games (along with 7 assists) in 2003 for the Hounds when they were competing in USL’s A-League. Martins was named the A-League’s MVP that year, as the Riverhounds failed to reach the playoffs finishing third in the Northeast Division behind Montreal and Rochester. Vincent, however, has a realistic shot at catching Martins’ single season mark, as he’s beginning to make his own special place in the Riverhounds record books. With three goals on Saturday, Vincent already has surpassed his former teammate, and 2013 USL MVP Jose Angulo, who then broke the league record with 15 goals (along with current Sporting KC star Dom Dwyer). Vincent now has 16 goals in USL (another three in Open Cup) — with 19 total. Both Vincent and OKC FC’s Danni König are four back of Kevin Molino’s single-season goal-scoring record set last year. In three years, Vincent’s amassed a total of 22 USL goals (and 26 overall if you count Open Cup games), Vincent is now in fifth place all time in team’s league goal mark, and trails the third place tandem of Angulo and Phil Karn (23 goals) by just one goal. Martins scored 30 in two seasons, and David Flavis is the team’s all-time leading scorer with 56 goals from 1999-2006. While it seems remarkable that Vincent has emerged as the Riverhounds goal scoring threat after just netting three league goals each of the previous two seasons, he’s deflected a lot of credit towards his new coach and a system that has helped him utilized his creative and scoring talents. “I’ve said it all season. (Head Coach) Mark’s (Steffens) has given me a lot of freedom. It has allowed me to get forward on every opportunity. Now, it nice to have that freedom, and know we have six guys that are there to sweep in underneath to defend the areas behind. While Vincent’s been playing a lot on the outside left side of the Riverhounds 4-2-3-1 attacking formation, he’s also been asked to take on a role in the central, holding midfield spot at times too. It still has not stopped him from being a scoring threat. “Rob has had such a great season. You can almost count on him every night to get shots on goal no matter what. It gives us confidence on the defensive side. Everyone feeds off him when he’s playing well,” said Calle Brown, Riverhounds goalkeeper. When addressed after Saturday’s game, Steffens made it clear where he stands as far as his goalkeepers are concerned. Calle Brown had just recorded his fourth clean sheet of the season while returning Ryan Thompson remained in street clothes recovering from sore knee after playing four games in the Gold Cup. So, it naturally begged the question, is there a goalie controversy? “Calle’s played well. But Ryan, being a national team keeper, deserves to get back in there when he’s healthy. We’re going to have to wait for him because his knee was still pretty sore. Not sure how long that’s going to take. He’ll get his opportunity as soon as he’s healthy,” said Steffens. Steffens added that overall, he’s been very pleased with his goalkeepers, who’ve stepped in during Thompson’s absence during the Copa America tournament in June, and CONCACAF Gold Cup in July. Brown came up with some big stops on Saturday. None may have been bigger or more spectacular than in the 42nd minute when he robbed Mark Godelman with spectacular diving save, extending in the air to his left on an inward bending shot. “Calle was very good tonight. He came up with two or three big saves with the game on the line — and kept us one up. Then, our attack took over at the end,” added Steffens. With the statement from Steffens, there is no controversy. Ryan Thompson is the number one goalkeeper as the Riverhounds now embark on their final stretch run of eight regular season games – and potentially into the playoffs. And Steffens now has two additional goalkeepers who now have some experience under their belt, who can be counted on again if called onto action. Brown feels that he’s only going to benefit from this experience. “Going forward every part of my game will need to improve,” said Brown. 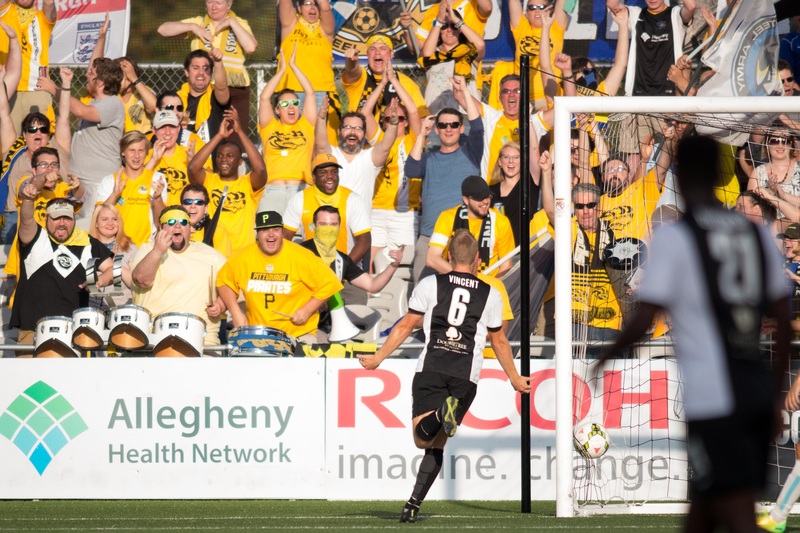 The Riverhounds had a big sigh of relief on Saturday – as with their eight win – they moved three points clear of their in-state rivals Harrisburg City Islanders in the USL’s Eastern Conference standings, as Harrisburg were defeated by Richmond, 4-2. With eight games remaining, the Hounds and their USL competitors are now in the home stretch of the season. After losing three-straight games, Steffens replaced three members of the back line that had started the previous game (Anthony Arena – suspension, Conor Donovan – called back to Orlando City, Mike Green – moved up to forward). Steffens found solace in that he was still able to start a veteran back four that consisted of Sterling Flunder (age 29, third all-time with 125 appearances with Riverhounds), Matt Dallman (age 30, fourth year with Hounds, former USL assist leader who also played professionally in Germany for 4 years), Fejiro Okiomah (age 24, but USL/NASL veteran with his third pro team) and Willie Hunt (age 27, 83 professional appearances for three pro teams). Flunder and Okiomah had missed the previous games due to injuries. Steffens was glad he could lean on his experienced players to help his team out of their slide. “Oh that was big for us. Knowing that we had veterans back there really helped us tonight,” said Steffens. Consistency will be the key theme for the Riverhounds in their final eight games. And this is especially true with their defense. In many of their losses, the Hounds have had defensive lapses that caused them to play from behind. Two Okiomah slips early in Montreal and Louisville City July games come right to mind. 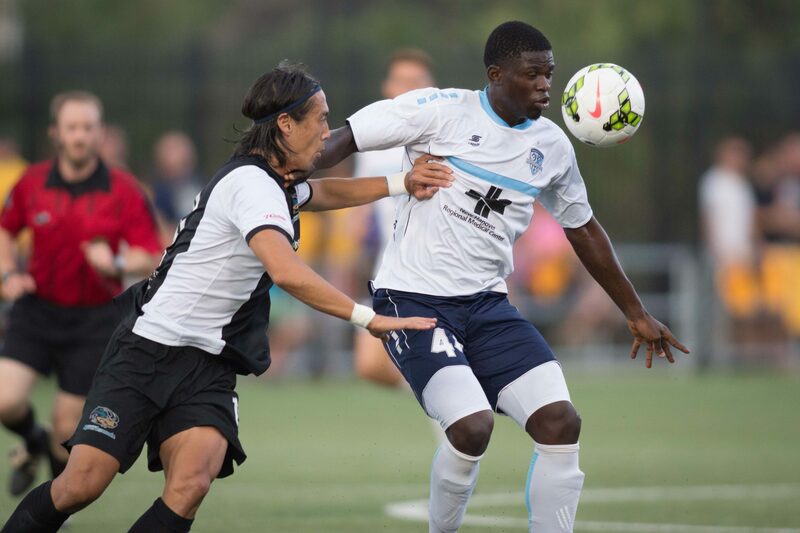 The Riverhounds three-point lead in the standings for the final playoff spot is perilous. Harrisburg has played two less games, and Charlotte, who has already beaten them, who they will play two more times, and has played three less games. Every point counts now — and Steffens should be glad he has a lot of battle tested veterans that he can count on for the remainder of the stretch run.